Spending time together in front of a campfire is an undeniably wholesome activity – gazing at a fire will fill you with sense of wellbeing that staring at EastEnders just never will. Trust me. We don’t often admit it (especially not to our children), but making fire is FUN, cooking on a fire is FUN and just sitting by a fire with your friends or family is BIG FUN. Luckily, if all of this is done with a modicum of common sense and in an appropriate location (as in - a campsite in Wales, and not - next to brandy-soaked Uncle Sid), then fires really can be good clean fun for all. Luckily, campsite owners are responding to this demand and you can now find more campsites in the UK allowing and encouraging campfires than ever before. Not only that, many will provide you with the necessary equipment and might even help you to get a blaze going if you're a first-timer. But follow our campfire tips below, and you shouldn't have any problems lighting up. 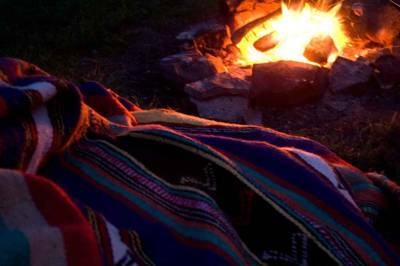 And when you're ready to go, check out our full list of campsites with campfires. Location, location, location! This is of utmost importance if you don’t want a forest fire on your hands (you don’t). Steer clear of overhanging branches and dry undergrowth. Firm, bare earth is best, or if your campsite has fire pits or braziers then make sure to use these. Also ensure that your fire is a safe distance from your tents. Your fuel and fire-starting equipment MUST be dry. Keep your matches in a Ziploc bag and store logs out of the rain. Start small. You can’t expect half a tree trunk to catch alight by waving a match under it. Either use firelighters and kindling, or very dry leaves or newspaper, then twigs, then kindling. Sheep’s wool makes for great natural tinder. Assemble a ball of tinder, then arrange your twigs or kindling around it in a tipi formation. This allows oxygen to circulate and gives the fire structure. Light the tinder in a few places. It should catch easily and begin to burn the kindling. A bit of gentle blowing might help at this stage. When the kindling is burning well, slowly add larger pieces of wood. BE PATIENT. If you get excited and pile on a ton of massive logs, the fire will probably go out. Feed the fire slowly and give it some love. TA DA! Your blaze will burn like a dream for the whole evening, providing light, warmth and entertainment for your camp. Remember, if you start a fire, you also have to put it out. Never abandon a lit or smouldering fire. Let it die down, then rake it around and douse it with water. If it continues to smoke, shovel some earth on top. So that's it - easy! Please note, some campsites that do allow campfires insist that you only have them in designated fire-pits, or off the ground (in braziers), so it's always worth checking the rules. Below are just 10 of our favourite campfire-warmed campsites, or go straight to our full list of campsites that allow fires. In keeping with the basic wild camping vibe, proper open campfires are permitted at this popular riverside retreat. Wood is available from the farm's own surplus stock. Campfires are not just allowed here, they’re positively encouraged! The Fox Wood Camping team don’t think a camping holiday is complete without one, and we’re inclined to agree. Each pitch at Denmark Farm is carved out of the long, wild grass with braziers provided for campfires, raised off the ground. This setup is totally geared towards creating unforgettable campfire cuisine. Firewood is readily available and workshops show how the woodland habitats can be sustainably managed. The crackle-and-pop of wood on the fire is sometimes the only noise of the evenings at this natural, 50-pitch campsite in Cornwall. Campfires are encouraged and toasting marshmallows from the nearby village shop is too. Form a symbiotic relationship with the trees all around you at Hole Station, where all the firewood is gathered from trees coppiced and pollarded on site to give young oaks more light and space to grow. Hand-chopped logs, kindling and firelighters are bundled together in a handy kit for you to collect every evening. Campfires are very much a part of any stay at this family-friendly campsite, with bags of logs complete with kindling and firelighters sold onsite each evening. When the site was first being created, allowing campfires was at the top of their ‘must-do’ list. A wise choice. Spark up a crackler at this glamping and camping site in rural Norfolk. The long, wild grass is carefully managed here and campfires must be raised to protect it. Campfire cooking is strongly encouraged, though, with all the wares you need provided. This is a campsite where ‘wild camping pitches’ deserve the name the campsite has given them. Bed down in the thicket and light yourself a good ol’ fashioned campfire. It’s what this place is all about. This traditional New Forest campsite is right next door to a good local pub. So even if you don’t manage to cook over your own campfire you can still enjoy some good food. This family campsite is within easy striking distance of London. Leave the big smoke for a little campfire smoke instead, with logs available by the bag load and campfires at every pitch.